Photo Ã‚Â© Ro, 2004, used here with her permission. 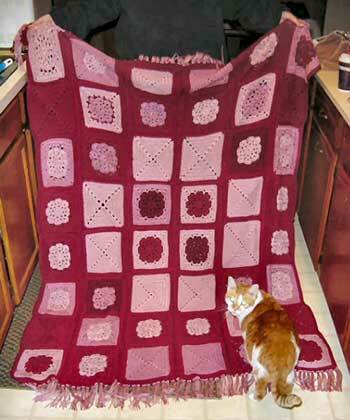 Fourteen women crocheted squares for this ghan–Jayme, Julie, Chie, Vera, Becky, Jenn, Rebecca, Debi S., Anna, Tiffany, Genita, Chris, Karin, and myself. We used two patterns for our squares, the Friendship Jewel Square and the Basic Solid Granny. (Unfortunately the site with the solid granny went down shortly after we started the ghan and is still down, but I’ve posted the link anyway). The two basic colors were dark rose (Caron Simply Soft Raspberry or Wintuk Rosewine) and light rose (Caron Simply Soft Victorian Rose or Plum Wine). For those who are curious as to how we chose the participants, I suggested to Jayme that she e-mail folks who had commented in Ro’s blog recently. She did and we had fantastic response. I want give a big thanks to everyone who worked on this ghan, especially Jayme, who held it all together (no pun intended!). This was the first time I have worked with others to create a comfortghan and I was honored to be a part of this project. I curl up with that blanket now every night in front of the TV while I am crocheting my little heart out. I am also now paying it forward and participating in a comfort ghan for someone else hoping it gives the same comfort as it gave me. Awesome project, Donna – great job! I think you all did a wonderful job on the comfort ghan, it really is beautiful! I’m glad that I the afghan turned out so well, and that Ro likes it. The afghan is beautiful and more so since it was made by friends.